Reunions of the veterans of the 11th Light Infantry Brigade, 4th/3rd Infantry are due in large part to the efforts of Dan Behrens, brother of Tom Behrens who served Delta Co. 4th/3rd, and was killed in action in 1968. Dan wanted to learn more information about his brother’s service in Vietnam and anyone who remembered his brother. His tireless search led him to about 30 or more of his brother “brothers” that have been brought together. Dan's work in reuniting this group of veterans made Bruce Flaherty think of how to show their gratitude to Dan Behrens for reuniting the members of D/4th/3rd. So, at the 2006 reunion in Washington D.C., Bruce Flaherty came up with the idea to present an American flag to Dan and to two other families of 0/4/3 KIAs. They obtained three flags that had been flown over the U.S. Capitol on July 4, 2006. 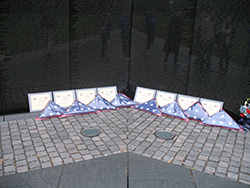 At the 2008 reunion, presentations of the three flags were made at the Vietnam Veterans Memorial. 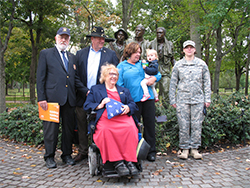 Flags were presented to Mrs. Mary Anne Allison in honor of her brother Lt. Henry Warner; Tom Behrens flag was sent to his brother Dan; and a flag to remember Duane Downing went to the Downing family who in turn donated the flag to the St. Johns Veterans Memorial Organization. That flag now flies over that memorial. Bruce has also presented the Old Guard with flags flown over the capitol and certificates for the 4th/3rd regiment, Alpha Company, Bravo Company, Charlie Company, Delta Company, Echo Company, HHC and Medics in memory of those killed in action in the Vietnam War. Locating a family member is not an easy task. This is a long and time consuming project and Bruce could use our help. So if you know of a family member of one of the KIA’s listed below, please contact Bruce. If Bruce cannot present the flag and certificate himself, he contacts the Patriot Guard Riders or other organizations that assist and requests that they make the presentation to the family. These flags and certificates mean a lot to the family. Click HERE if you would like to visit the photo gallery of some of the families that have received their loved one's flag. Bruce Flaherty can be contacted by directly by email at bflahe617@aol.com or by postal mail at 3526 168th Street, Flushing, NY, 11358. Bruce would greatly appreciate donations, as the flags flown over the capitol cost $27.05 each. He greatly appreciates those who have donated. Of the 288 men killed in action that served the 4th/3rd Infantry, 11th Light Infantry Brigade, Americal Division; 51 flags have been presented to the individual families. Those names highlighted with a light blue background have had memorial flags and certificates presented to the family member(s). We have a long way to go to see this project to completion! Please see if you can help. Thank you. These lists have all been updated based on the work Bruce Flaherty has been doing. To date, 90 flags have been presented to families.